Women entrepreneurs understand the power of the media to reach communities and to provide essential communication and education to both adults and children alike, in particular to women in remote communities. Kristine Pearson, the founder of Lifeline Energy, knows only too well how much of a lifeline radio can be, hence the name of the enterprise. By harnessing the power of solar, she is creating access to radio to millions of listeners who would previously be denied the opportunity - she is a real game-changer on the African continent. LoA had the opportunity to learn more about this inspirational enterprise this month and how it is changing lives for the better. "As a social entrepreneur, I feel a deep sense of purpose and responsibility for the people we serve. I’m driven by the purpose that I feel for our mission, aligned with a clear responsibility to do the very best for the people using our products, especially women and girls." Lifeline Energy is a pioneering non-profit that designs, manufactures and distributes solar-powered and wind-up media players and radios for classrooms and community listening groups. Since 1999, nearly 600,000 wind-up and solar powered radios and media players have been distributed, reaching an estimated 20 million listeners. We work mainly in sub-Saharan Africa, often in remote and under-resourced areas, where people would otherwise have little access to news and information. Despite inroads made by phones, tablets and computers, radio, which builds on long-standing oral traditions in Africa, is thriving. It remains the most used communication media on the continent. Our products are designed for group listening and focus mainly on children and distance education, child-headed families, women and refugees. When disasters strike, we respond to humanitarian emergencies around the world with radio and lights for displaced populations. Lifeline Energy is a charity registered in the U.S. and South Africa. The charity owns a for-profit company, Lifeline Technologies (LT), that manufactures our products, and this creates a unique hybrid business model. Any profits from Lifeline Technologies accrue to Lifeline Energy to further its charitable activities. Lifeline Energy does not sell directly to consumers. Instead, we have partnered with dozens of organizations – corporations, international and local NGOs, government ministries and U.N. agencies – to ensure our products are delivered correctly and quickly to those in need. We provide a full service that includes project design, logistics support, training, and distribution. Also, we provide support and advice on listening group facilitation, monitoring support, and maintenance. Lifeline works across development sectors including education, health, agriculture, peace-making, the environment, and emergency response. "Lifeline Energy is a pioneering non-profit that designs, manufactures and distributes solar-powered and wind-up media players and radios for classrooms and community listening groups." "Despite inroads made by phones, tablets and computers, radio, which builds on long-standing oral traditions in Africa, is thriving. It remains the most used communication media on the continent." 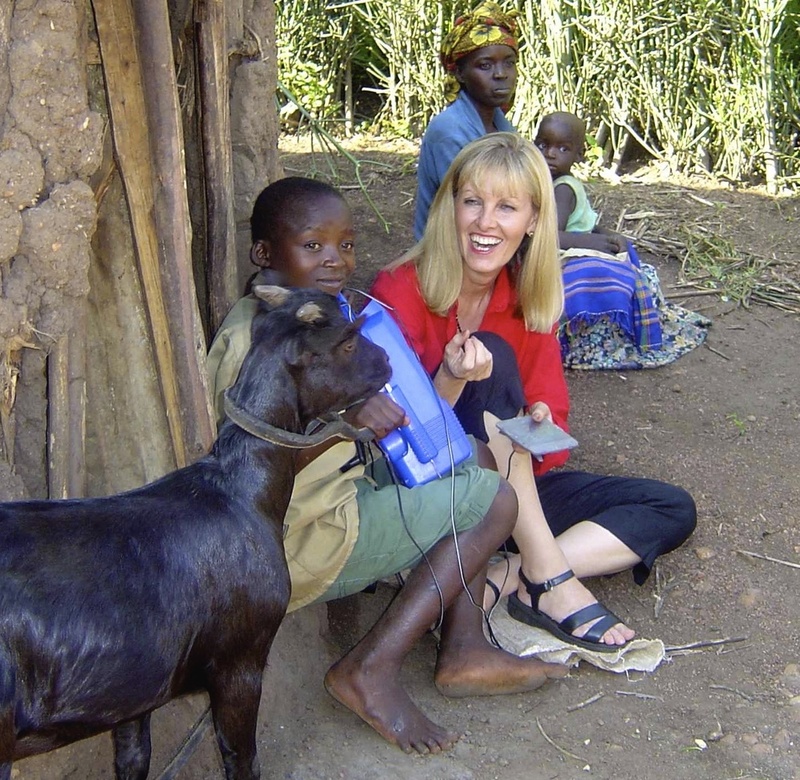 In 1999 I had an amazing opportunity to launch a non-profit (then called the Freeplay Foundation) to bring wind-up technology and radio access to critically poor populations in Africa. At the time I was on sabbatical from a large South African banking group and I found the challenge irresistible. One of the first things I did was to take an original model wind-up radio to rural Mozambique. I sat on the ground talking to women who lived in a traditional mud and thatch village. They told me that men had money, and that they bought radios and the batteries to power them. Men even removed them when they went to work so they controlled access to listening. This meant that women weren’t hearing the radio programmes that were created to benefit them. The penny dropped. If women had access to radio information, outcomes would change, and serious issues around poverty, health, education and so forth could be addressed. At the time, millions of dollars were being invested in important developmental radio content, but no-one was looking at radio access. I saw examples all over Africa for the motivation for a power-independent radio. As a result of genocide and HIV/AIDS in Rwanda 100,000 child-headed households needed information on everything a child would normally learn from a trusted adult. In Zambia, as two teachers were dying of HIV/AIDS for every one that was trained, a new radio-based primary education program called Learning at Taonga Market was being created to grow the teaching capacity of literate adults; but providing large, battery operated radios would be completely unsustainable. I believed that a large solar and wind-up radio that provided on-demand, sustainable listening access, designed for children living on their own and distance education was urgently needed. We won the very first Tech Museum of Innovation Award in the education category in 2001, which enabled the ground-breaking Lifeline radio to be created. Over the years, the Lifeline radio along with its updated successor, the Prime, has provided information and education opportunities to millions in Africa who would otherwise not have had listening access. And with our biggest innovation – the Lifeplayer MP3 – we created the world’s first media player, 5-band radio and recorder for humanitarian use and group listening. With the Lifeplayer, distance learning and education is made possible in even the most remote areas. Unlimited hours’ worth of audio lessons can be pre-recorded on microSD cards, and radio broadcasts and live voice recorded. The content can be listened to as many times as necessary. Teachers can record their pupils’ voices and as students learn a language, they can hear themselves speak. The Lifeplayer creates opportunities for people to be in charge of their own development. "Lifeline Energy does not sell directly to consumers. Instead, we have partnered with dozens of organizations – corporations, international and local NGOs, government ministries and U.N. agencies – to ensure our products are delivered correctly and quickly to those in need." There is no shortage of audio content created by NGOs, government ministries and others that provide learning and education opportunities for African listeners. Lifeline’s products answer the challenge of energy poverty and the high cost of batteries, providing listening access to people living in even the most remote, under-resourced areas. Without a power-independent radio or media player, audio content is just not going to be heard in many parts of the continent. Our products are designed for group listening, making them ideal for classrooms, women’s listening groups, or farmer collectives. They enable people to come together not just to listen to the content, but also to discuss what’s been broadcast, and to support one another. Radio remains ‘Africa’s medium’ and it’s thriving. Its wide accessibility is a result of a number of factors - liberalization of media policies, affordability, geography, and low literacy levels. Radio is never overloaded by the number of people tuning in. It provides the maximum reach at the fastest possible speed. It spurs social change in ways no other mass medium can. This sets it apart from other media platforms in facilitating political debate, shaping identities, providing practical information and assisting listeners as they negotiate the challenges of everyday life. Radio builds on strong oral African traditions in its dramas, stories of ancestors, and poetry. Despite the advances made by television, smartphones, and computers, millions of people living in remote or un-electrified areas still have no ready access to news or information; and radio remains the best and most cost-effective way to reach them. Likewise, despite what is published in the media, the vast majority of poor women in Africa we’ve met still do not own phones and, if they do, the phone is often outdated, with an old battery, or there is precious little money for air time. We are a small and deeply committed all-women cohort who work closely together. I head up both Lifeline Energy and Lifeline Technologies, and I’m supported by marketing and logistics teams. Bridget Schramm heads up Logistics. She liaises with our factories, arranges shipping and ensures that our products are delivered on time. Bridget has over 10 years’ logistics experience, and was previously involved in setting up schools, hospitals and health care centres in sub-Saharan Africa. As our Marketing and Communications Manager, Deborah Torrington deals with our customer base, donors and other interested parties. Deborah has worked in marketing communication roles for many years, and has a particular passion for education in Africa. We have taken the approach to stay as lean as possible and we leverage scale through partnering with complementary organizations. "Over the years, the Lifeline radio along with its updated successor, the Prime, has provided information and education opportunities to millions in Africa who would otherwise not have had listening access." As the youngest child with much older siblings in California, I developed a well-defined sense of independence and self-reliance early on. I attended 11 elementary schools and found that I had to adapt every year. This, along with reading National Geographic and my wanderlust, led me to travel widely immediately after graduating from university. In 1986 I spent three months travelling solo in East and Southern Africa, and knew that this was where I belonged. Travelling has been my biggest teacher and has shaped my world view. In 1989 I immigrated to South Africa during the height of the state of emergency. I set myself up in a consultancy specialising in the development of women in business. This led to a head office executive position at a South African banking group, Nedcor. Even though it was a corporate environment, I enjoyed a relatively high level of freedom and creativity, and spent more than seven fulfilling years there. When I was asked to lead the newly established Freeplay Foundation, I had no concept how much this was to irrevocably change my worldview, and my career trajectory as I ‘crossed-over’ from business to the non-profit sector. I found that my business, results-oriented approach was helpful in getting a lot accomplished in a short period. Although I had travelled widely in Africa, I knew little about development or NGOs and how they operated. Our start-up phase was extremely exciting, especially after we won the first Tech Museum of Innovation Award in 2001. Not long after, both my husband and I became fellows of the Schwab Foundation of the World Economic Forum, which recognises outstanding social entrepreneurship. The term social entrepreneur was not widely known at that time. And now, 17 years later, I still love my work and am privileged to have visited 30 countries on the continent; and love everywhere I've visited. Our products are no less valuable in enabling people to sustainably access the information they need to make more informed choices and decisions and improve the quality of their lives. Every time I go into the field, I feel so proud of the difference that they make in people’s lives. 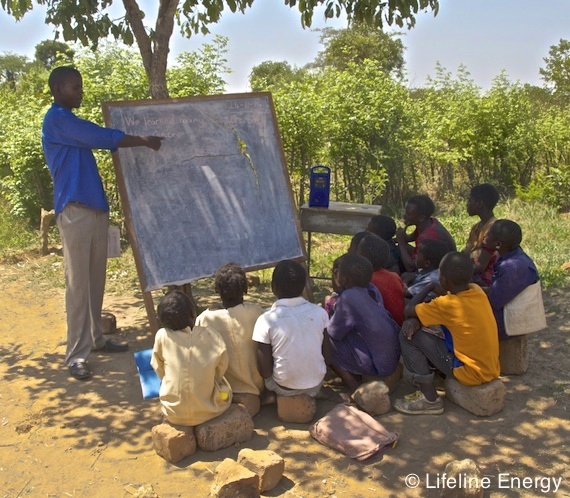 Lifeline has worked in 20 countries in Africa, on projects ranging from education to health, and from farming and conservation through to peace efforts. In the future we are looking to expand the projects we’re already involved in, and will continue to look for other opportunities to bring our products to the people who need them. A big area of growth for us has been in emergency response. Information and light are critical for displaced populations. Further, the need for information around climate change, the environment, and the empowerment of women will become increasingly important; and radio has a central role to play. The innovative role radio plays in the education of children will continue to be one of our most important focus areas. The way we work is premised on the development of partnerships, and we’ll also be looking to strengthen existing and create new partnerships with other NGOs, government ministries, corporations and UN agencies. "Lifeline’s products answer the challenge of energy poverty and the high cost of batteries, providing listening access to people living in even the most remote, under-resourced areas." As a social entrepreneur, I feel a deep sense of purpose and responsibility for the people we serve. I’m driven by the purpose that I feel for our mission, aligned with a clear responsibility to do the very best for the people using our products, especially women and girls. Don’t take ‘no’ for an answer, and be persistent. There have been many times in my adult life when someone else has said “It can’t be done”, “It won’t work”, “You can't do that”. If I feel strongly about something, I am relentless in finding a way, sometimes an unconventional way, to make it happen. You have to have tenacity. The social enterprise sector is tough. Rejection is far more prevalent than success, and being tenacious is fundamental.